We’d like to thank our sponsors big time! From day one, Pedal Power have been absolutely awesome in helping us organise this event and both Hit 104.7 and MIX 106.3 have been right behind us too, with promotional support. Workin’ Gear have decked our team out in very impressive fluro tops, so you certainly won’t miss us! Club Lime and Canberra Mums’ have also been really supportive in helping us spread the word, whilst Shane from Mobile Bicycle Workshop always tries to make himself available to help with minor bike repairs and adjustments. A big thanks also goes to the ANU who generously donate bikes the have been “abandoned” on campus . Fyshwick Self-Storage have been very generous too, in letting us safely store a “shed full” of bikes prior BUYCYCLE. Then there is the 2B team, who have provided hour upon hour of probono support with our website and print materials…legendary! 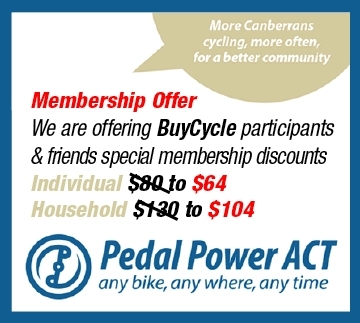 The bottom line is that without community spirited sponsors like all these guys, CANBERRA BUYCYCLE couldn’t happen. The Rotary Club of Canberra thanks you all. Australian Rotary Clubs are part of an international network of business, professional and community leaders who strive to make the world a better place through practical efforts and The Rotary Club of Canberra is no exception. Our efforts are concentrated in what we call the ‘5 avenues of service’. Club, Vocational, Community, International and Youth. Our Club takes pride in its record of “service above self” and our success reflects the diversity of vocational expertise and the humanitarian natures of our members and regularly, their partners. We enjoy fellowship and working together, to achieve better and sustainable outcomes for mankind, our efforts may few focused literally next door within our local community, or across the world. Our club meets once a week for one hour. So if you’d like to join a Monday Luncheon Club Meeting to see what we are about, we promise we’ll make you most welcome. Just send us an email to canberrarotary@iinet.net.au and we’ll be in touch. Alternatively you can also find us on Facebook or visit our Rotary Club of Canberra website.